While changing the parameter icm/HTTP/max_request_size_KB , I faced the issue as “SetProcessParameter failed :2 permission denied”. I did a little digging to understand what it is SetProcessParameter meant. The SetProcessParameter Sets dynamic Profile Parameters for a given process. This is taken care by sapcontrol. So sapcontrol is responsible for taking care of the ‘SetProcessParameter’. Now assuming you are changing a dynamic parameter this will be invoked. But when I was trying to change the parameter I was getting the error as SetProcessParameter failed :2 permission denied. The SetProcessParameter is a protected webmethod and this is taken care using the parameter service/protectedwebmethods. More more details on which webmethod falls under protected or unprotected please refer this awesome blog Protected web methods of sapstartsrv . In this we can see the SetProcessParameter comes under the category of ‘service/protectedwebmethods = SDEFAULT ‘ . 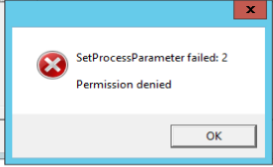 When I checked I could see that I was getting the permission denied entry which means I was not calling the parameter SetProcessParameter with the correct settings. To resolve the issue I set the parameter to service/protectedwebmethods = SDEFAULT . Post this I took a restart and this resolved my issue.